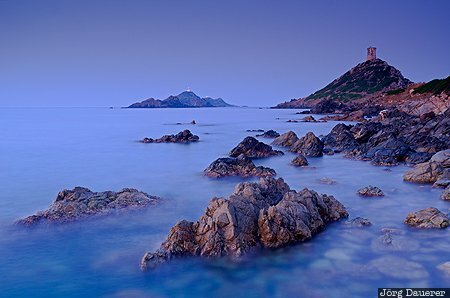 The mediterranean sea with rocks in the water and the Sanguinaires Islands (les Iles Sanguinaires) in the background at the blue hour before sunrise. The water of the mediterranean sea seems to be calm due to the long exposure time of 20 seconds that had been used. The Sanguinaires Islands are west of Ajaccio, the capital of the island Corsica, France. It is in the department of Corse-du-Sud. This photo was taken in the morning of a sunny day in September of 2011. This photo is part of the exhibition Water in Motion (October 2012). This photo was taken with a digital camera.